Libya’s flag is made up of three horizontal bands of red (top), black (double width), and green with a white crescent and star centred on the black stripe. The colours represent the three regions: red for Fezzan, black for Cyrenaica, green for Tripolitania. The crescent and star represent Islam. This was the flag of the former Kingdom of Libya (1951-1969) and was reintroduced by the Transitional National Council (TNC) on 27 February 2011. It replaced the all-green banner instituted by Gaddafi in 1977, which itself replaced two earlier flags introduced by Gaddafi: a red-white-black horizontal tribar (1969-1972), and the same flag with a with the hawk of Quraysh in gold in the middle, which was used during the ephemeral Federation of Arab Republics (1972-1977). The anthem of the former Kingdom of Libya was ‘Libya! Libya! Libya!’ (words by al-Bashir al-Arabi, music by Mohammed Abdel Wahab). In 1969 Gaddafi introduced an anthem ‘Allahu Akbar’ (God is Great), with lyrics by Mahmoud al-Sherif and music by Abdallah Shams al-Din. This was originally a battle song of the Egyptian Army in the 1956 Suez War. The former royal anthem was reintroduced by the TNC in 2011, without a verse glorifying the monarchy. Libya has huge oil and gas reserves and a small population, making it one of the richest countries in Africa, in per capita income, but it is still largely dependent on migrant workers from sub-Saharan and other North African countries. Unequal distribution of hydrocarbon revenues, a high unemployment rate, and dissatisfaction with the limited freedoms of a regime that declared itself revolutionary finally pushed the population to rebel. In February 2011, the first Libyan protest of the Arab Spring took place. In October of that year, after ruling for 42 years, Muammar Gaddafi was killed, and the regime was finally overthrown. In July 2012 Libya had its first free elections. The area that is now Libya has always been part of the varied cultures of the Mediterranean region: Greeks, Romans, Arab Muslims, Spaniards, Ottomans, and Italians have all ruled Libya at different times and left their mark. Libya’s strategic position halfway along the Mediterranean’s southern coast and at the end of the trans-Saharan caravan routes that linked it with sub-Saharan polities meant that it was a valuable prize. Yet none of its foreign rulers did much to develop the region economically. 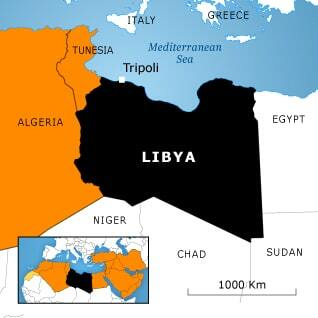 After the Italians were expelled during World War II, Libya was reduced to a barren backwater.